Its a Wonderful Movie - Your Guide to Family and Christmas Movies on TV: You Can't Fight Christmas - a TV One Christmas Movie Premiere! 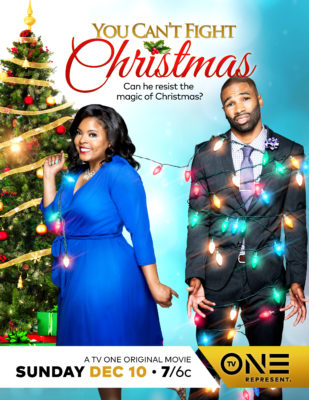 You Can't Fight Christmas - a TV One Christmas Movie Premiere! Storyline via TV One: In You Can’t Fight Christmas the Chestertown Hotel is being all decked out for Christmas by Leslie Major, played by Brely Evans (Being Mary Jane, Born Again Virgin), who is the designer behind the Christmas magic. While decorating the hotel, Leslie finds out about the plans that Edmund James, played by Andra Fuller (Love By The 10th Date, Black Jesus), nephew of the hotel owner, and his uptight business partner and love interest Millicent (Persia White of Girlfriends fame), have to turn the old hotel into an upscale resort once Edmund inherits the hotel from his uncle. Scheming Millicent also has plans for Edmund that involve a wedding ring but Edmund may not be ready to take their partnership to the next level. Leslie enlists her merry team of helpers to help save the hotel and in the process, shares more than a little Christmas spirit with Edmund, who hasn’t celebrated Christmas since his parents divorced around Christmastime when he was teen. Actress Marla Gibbs makes a special appearance in this holiday romance as one of the many hotel patrons who return to the homey Chesterton every Christmas season. it was to cliche, predictable and to much hair. What was the song playing when Edmund went to Leslie’s house to apologize?